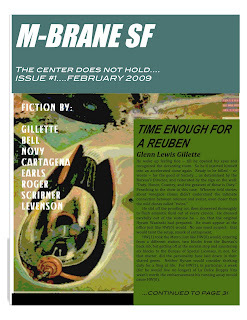 To the right is an image of the front cover of issue #1 of the M-Brane SF magazine. The stories start right on the front of it, with Glenn Lewis Gillette's clone tale "Time Enough for a Reuben" leading it off. The complete issue is still undergoing some editing and formatting, but it's way close to being presentable and I may decide to go ahead and put it out ahead of its scheduled 2/15 release date. I'm not really wanting to move up 3/15, however, so I haven't decided for sure yet. I have been getting troubling information about possible glitches with PDF file creation and what happens to the documents on other people's computer displays if the fonts are not what they call "embedded" properly. Apparently in the Adobe Acrobat standard, there are a set of fonts that it defaults to and wants to translate everything into if the originals are not embedded, thus making the document display like a piece of decroded crap. This concern first came to my attention when I started shopping for print-on-demand publishers for the print edition, and all their sites were all full of FAQs and grim warnings about how they need the PDFs submitted to them with embedded fonts, and how if you are using a Mac (like I am) then it's nearly impossible to get it right for some reason, blah, blah, blah (because the Mac allegedly doesn't "distill" it the same way one would using the Adobe.) Well, the print situation is one thing, and I think have that almost solved also. But I became concerned that my regular electronically distributed edition would get effed up somehow because of this font foolishness. This morning, however, I took my MacBook over to Pat's house for a test run. He also uses a Mac, but for his job he always has with him a work-provided PC, one of those typical, clunky, no-frills, workhorse laptops that companies issue to people for work purposes. We figured it was a safe bet that this machine would be not any better or fancier, if even as good, as any PC that any M-Brane reader might be using, and that it would use Adobe Acrobat Reader to try to read the file (as opposed to how a Mac will use Preview or the web browser to look at it if one isn't using Adobe). Well, I couldn't figure out for sure if my fonts were embedded or not, and I wasn't necessarily trusting what Adobe Reader was telling me. So, with Pat and his work PC next to me, I emailed him the PDF of Issue #1 and we opened it (which took a minute on that older clunkier machine--it's a two and half meg file when all is said and done) in Adobe Reader and compared it side-by-side page-by-page with what displays on my screen and saw no problems. So I feel a lot better about the technology now. If one theme defines my life to date it is that I seem to always believe that I can do pretty much anything and that it will be reasonably easy...despite the overwhelming crush of evidence and history to the contrary. So just once, with M-Brane, I'd like to catch a break and just have it work as planned. I think it will! I love the old-school SF look of the cover! Awesome. So, not to put you on the spot, but because it is a subject that has occupied my own mind lately... what kind of marketing or promotion do you envision for the magazine? I ask this because it strikes me how much effort goes into these magazines both on the side of the writers and that of the editors/publishers, to see so little done on behalf of all that work once it is 'out there'. Having some background from an unrelated field could be a strength in that you may bring skills/resources/insights that others may lack. A 'can't see the forest for the trees' kind of thing. Anyway, just some of my idle thoughts way too late at night when I should be sleeping. I'm considering a number of ideas to promote it--and am open to anyone's suggestions on it, too. At the moment (since the thing hasn't even started publication) the awareness of it is understandably quite limited. There are not many actual subscribers yet, so if I were to just send out issue #1 to those few people and the writers, hardly anyone would see it. So, I am thinking that I need to get it out there all over the place right from the start. I have been compiling a lengthy email list of people to whom I would like to show issue #1, ranging from "important" folks in the writing and publishing fields to other zine editors to a lot of regular civilians who have sf-related blogs or websites. So I am planning to do a vast free distribution of #1 in hopes of attracting some new readers and, at the very least, hugely increase the number of folks who have at least heard of it. In addition to that, I will increase my effort to get linked as much as possible from other sites. Ultimately, the project needs to have at least a modest income, because while I don't pay the writers much, I still need to raise some funds for that (and it would be super cool to pay them more someday if that becomes possible). I think once it gets established, then ads can be a money source as well, though I'd rather rely on readership and not spend a lot of time on things like that. I believe the first thing, though, is just to get the word out as quickly as possible upon the first publication and then keep it up consistently, so I'll be considering ways to do that all the time. 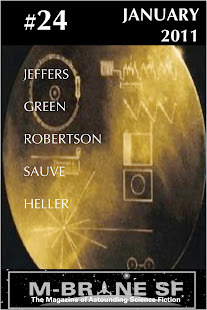 internet review of science fiction -- they may accept reviews of the magazine for publication but it would need to be by someone not published in the magazine or affiliated with it. locusmag.com -- Should at least be in the links page, but also they list new magazines issued each month. I wish I knew more about getting into the retail space. I see several of the smaller mags in the shelves at B&N, Hastings, etc., so I know it is possible.